Osteogenesis Imperfecta is the first translational reference professionals can turn to for a source of comprehensive information on this disorder. Although several reviews of the field have been published in various journals, there is no other single source for a compendium of current information. Separate chapters discuss each of the several clinical features of OI. Ethical issues related to OI are discussed, as is the importance of nutrition in managing the OI child and the OI adult. The role of physical medicine and rehabilitation for OI patients is also presented, along with the current status of OI medical treatment and the prospects for genetic engineering in the future. The text also provides the orthopedic surgeon with an advanced discussion of surgical techniques applicable to OI. Dr. Jay R. Shapiro is a graduate of Franklin and Marshall College and the Boston University School of Medicine. He serves as Professor in the Department of Physical Medicine and Rehabilitation and Director of the Bone and Osteogenesis Imperfecta Department at the Kennedy Krieger Institute. He served as Director of the General Clinical Research Center at Johns Hopkins University and is on the Medical Advisory Committee of the Osteogenesis Imperfecta Foundation. Dr. Shapiro also served as the Chief for the Bone Team of the National Space Biomedical Research Institute. Dr. Shapiro has specialty interests in endocrine, metabolic and genetic disorders of bone. Current research activities include: heart disease in adult osteogenesis imperfecta, the effect of nutrition on bone growth in osteogenesis imperfecta, osteoporosis in Rett syndrome and a study of the effects of bisphosphonate treatment during microgravity on the International Space Station (NASA). 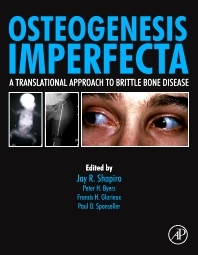 EXCELLENT, RENOME AUTHORS AND DETAILED CONTENT, COVERING ALL THE ASPECT OF OSTEOGENESIS IMPERFECTA.